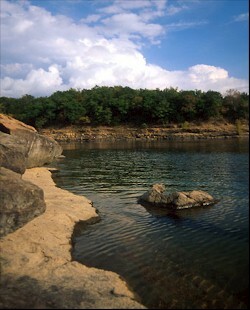 Located on the Illinois River a few miles south of Tahlequah, Lake Tenkiller lies in the heart of the Cookson Hills and reaches more than 25 miles up the river into Sequoyah and Cherokee Counties.�Tenkiller is the clearest body of water in Oklahoma. The 13,000 acre lake consist of rocky bluffs, secluded coves, and serene, lush forest that provides beautiful scenery from any area on the lake. Anglers may choose from various bass species, crappie, catfish, bream and walleye. Rainbow trout are stocked below the dam. Spring - White bass (sandies) provide excellent fishing opportunities in the spring as they head for the upper Illinois River to spawn. Carter's Landing to Horseshoe Bend is an excellent area to catch the spring run. Crappie fishing is usually best in the spring as the fish prepare for spawning. Look for small pea gravel type banks and shallow willow trees. Summer - Largemouth bass move to deeper water during the hot summer months. Night fishing is popular due to the heavy day use on the lake. Smallmouth bass provide some scrappy fighting in the summer. Most successful areas to catch smallmouth bass are in the upper Illinois River and Baron Fork Creek. White bass begin to school during the summer months. Areas near Cookson, Chicken Creek, and Snake Creek are good choices. Crappie can be found in deep water during the hot summer months. Catfishing really picks up during the summer. Fishing the deep water near mud flats around Pettit Bay, Standing Rock and Carter's Landing are excellent choices. Fall - Largemouth bass return to the shallows as water temperatures start to cool back down. White bass can be caught along the windy, rocky points. Crappie move back to the shallows and can be found on submerged brush. Catfishing is good in ten to twenty feet of water. Winter - Largemouth bass seek deep water for winter months. Fish deep underwater structures. White bass also seek deeper water. Crappie can be caught from one of the heated fishing docks around the lake. Marinas & Boat Launching: The State of Oklahoma and the U.S. Corps of Engineers manage ten marinas and fourteen parks with many different facilities around the lake. Four of the marinas, Pine Cove, Barnacle Bill's, Burnt Cabin and Sixshooter, also serve as floating restaurants that allow casual dress straight from the lake. There are twenty-four boat launching ramps around the lake, and many islands to explore, the most famous being Goat Island , which is actually inhabited with goats that can sometimes be spotted grazing at the shoreline. Camping is also big on Tenkiller with 14 campgrounds operated by the Corps, State of Oklahoma, and concessionaires. Types of camping range from primitive to full hookup and are pretty evenly spread out from one end of the lake to the other. � 2005 Angler Guide, All Rights Reserved.